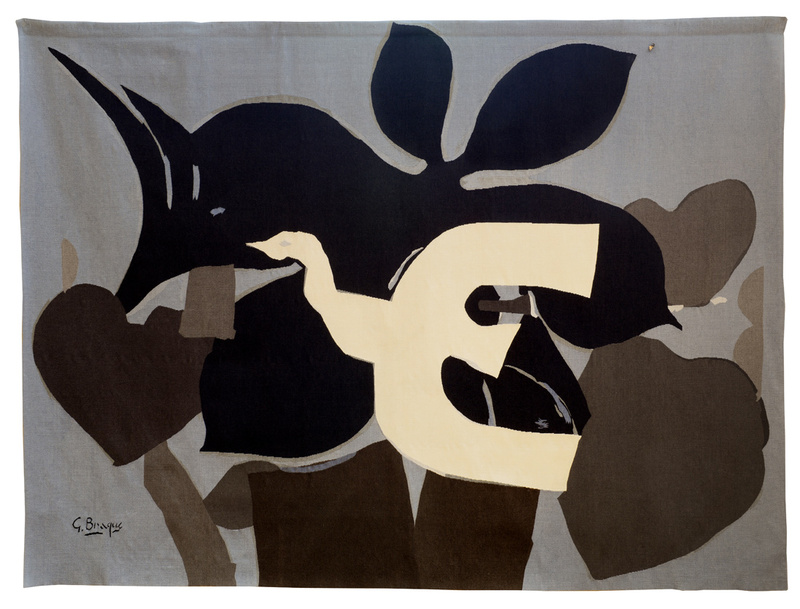 The 20th Century is a period of disruption, where the tapestry reinforces its link with the avant-garde creation. Some institutions such as the Aubusson National School of Decorative Arts and personalities like Antoine-Marius Martin (School’s director) , Marie Cuttoli (collector and textile editor), play here a leading role. But history remembers mostly one name: the painter Jean Lurçat, founder of the tapestry renewal from the 1940’s onwards. In 1884, Aubusson’s municipal drawing School, founded in the 18th Century (in the move of the royal tapestry Manufacture reform), becomes the National School of Decorative Arts, beside Paris’ and Limoges’, with the same director Auguste Louvrier de Lajolais (1829-1908). The latter relies on professors from Paris to supply both provincial cities with models. The School, so called “ENAD” in French (Ecole Nationale d’Arts Décoratifs), plays an important part in the renewal of the tapestry art and technique in the 20th Century. The School dispenses courses of low- and high-warp weaving and “Saracen” embroidery, known under the name of Aubusson cross stitch embroidery. Well-known artists furnishes cartoons: Pierre-Victor Galland (1822-1892) , painter decorator; Charles Genuys (1852-1928), chief architect of the historical monuments; Henry de Waroquier (1881-1970), painter and engraver, professor at the Estienne School in Paris. From 1917, the Aubusson School’s new director, Antoine-Marius Martin (1869-1955) wishes to see the art of weaving evolve. He replaces painted cartoons (models for the weavers) by inked cartoons, so-called “à tons comptés”, which are now drawings with its lines marking out the divers colored surfaces. Then, very early, he would theorize and publish the principles of what he calls the tapestry Renovation twenty years before the artist Jean Lurçat, considered since the 1940’s as the inventor of this Renovation. In 1925, Antoine-Marius Martin, Aubusson School’s director, presents his researches of the tapestry renewal on a stand at the Grand Palais during the prestigious international Exhibit of Decorative Arts. The public discovers there totally unreleased student works and is amazed by the thickness of the used threads but catch a glimpse of the modernity of these young creations as well. Antoine- Marius Martin’s successor, Elie Maingonnat (1892-1966) pursues until 1958 the same dynamic, with the artist Jean Lurçat and his followers, from 1937 onwards. 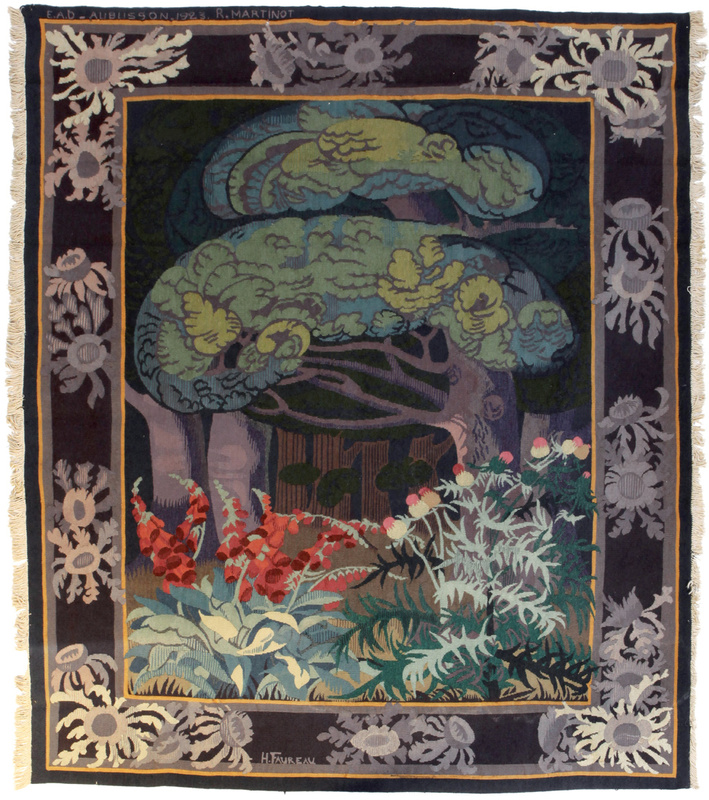 The new conducted researches within the Aubusson National School of Decorative Arts during the 1920’s lead to a painter’s movement knowing the tapestry techniques and are the authors of their own weaving-suitable cartoons. Thus, the textile interpretation, basis of the art of tapestry making, is here strongly mastered by the artist. In the early 20th Century, Jean Lurçat is an artist linked with the surrealist movement. His painting encounters a pretty good success, his mother and his first wife (Marthe Hennebert) realize for him massive needlestitch tapestries. 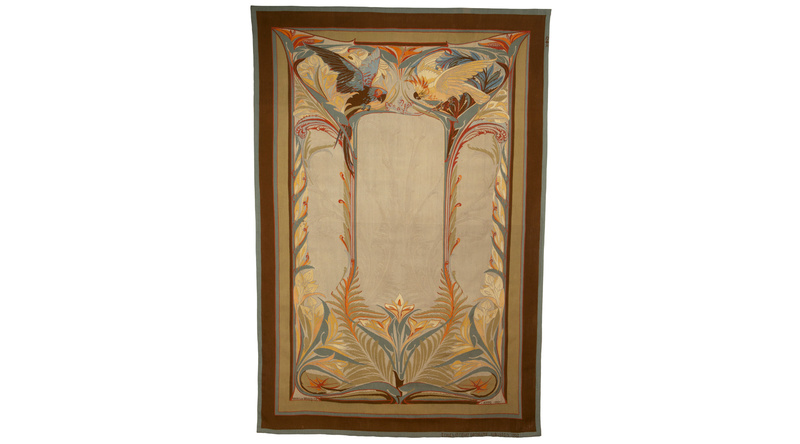 For the editor and collector Marie Cuttoli, he draws rugs and a first cartoon of tapestry is weaved in Aubusson in 1931. In 1937, he discovers the innovative work of the Aubusson National School of Decorative Arts, so as the 16th Century hanging, so-called “d’Anglards-de-Salers”, which makes a strong impression on him. The following year, he is deeply marked by the Apocalypse hanging in Angers. In 1939, the national Manufactures’ director, Guillaume Jeanneau, entrusts him with the order of a furniture ensemble with tapestry (weaved at the Gobelins) and a mission in Aubusson: find a new genre of decor. The models created are remarked thanks to the strength of their expressivity and their few vivid colors. Jean Lurçat is a great actor of the tapestry renewal in the 20th Century. He played a particularly important role due to the amount of orders he provoked, contributing to a workshop boost and many hiring (Dom Robert, Marc Saint-Saëns, Mario Prassinos, Robert Wogensky, Michel Tourlière, Mathieu Matégot etc. ), creating a very strong emulation in Aubusson. His tapestries with vivid colors have most of the time a monumental character destined to dress up modern architectures. His symbolic universe plays over the four elements, the vegetal and animal kingdom, the human’s place in the cosmos. The artist puts into frame poetic writings (of Eluard, Aragon, Tzara, Desnos etc.) and claims in his weavings the engagement in the Second World War Resistance. His graphics is characteristic and some motives such as the sun and the rooster are key symbols. Marie Cuttoli (1879-1973) is a woman with a strong personality, Avant-garde works collector in the beginning of the 20th Century, tapestry lover and art seller. She does not have any interest in the “official” artists of the Aubusson National School of Decorative Arts. She took advantage of her husband’s (Paul Cuttoli) nomination as prefect of Algeria to settle down there a rug manufacture, Myrbor. She entrusts the models creation to contemporary artists (Fernand Léger, Jean Lurçat). From 1928 onwards, she had Aubusson tapestries done by placing an order to several artists: Lucien Couteau, Jean Lurçat, Georges Rouault, Pablo Picasso, Georges Braque, Le Corbusier, Raoul Dufy, Man Ray etc. She had notably the Marcelle Delarbre workshop in Aubusson working. The weavings went immediately to her Parisian collection or to the USA, where she organized in 1939 an important touring exhibition with help of the collector Albert Barnes and the San Fransisco museum conservator. This exhibition and its escorting catalogs will develop an American customer base, acquainted with the French Avant-garde painter’s tapestry style. The impact is so big that even today, in the USA; “aubusson” is still used as a common name to qualify a low-pile carpet. There is a second stream, which marks the 20th Century, with some artists having tapestries occasionally weaved and who bound, if needed, with a cartoon painter made responsible for the adaptation of their original work to the tapestry of Aubusson weaving style. Pierre Baudoin (1921-1970) is an artist teaching at Aubusson’s and Paris’ Sèvres highschool. In 1946, he discovers the tapestry and falls in love with the question of the textile transcription of an art work, whose first purpose is not to become weaved. He becomes a specialist in this field as he developed tapestry cartoons from original works (often etching or small size paintings). He chooses the weavings’ texture (size of the stitch) and manages the wool dying. He works at first with Henri-Georges Adam, then for Le Corbusier, of who he would become the assistant in the realization of weaved works. He develops cartoons for George Braque, Alexandre Calder, Jean Arp, Pablo Picasso, André Beaudin, Max Ernst, Maurice Estève, Charles Lapicque etc. The weavings are subtle and relevant transpositions. Thanks to the intelligence and the accuracy of Pierre Baudoin’s adaptation work, the artists were always fully authors of their works weaved. In 1951, Denise René, gallery owner in Paris, specialized in abstract and optical art, begins to edit tapestries with the will to create previously unseen and experimental pieces. To produce these new works, she gets in touch with François Tabard, head of one of the most important tapestry workshop in Aubusson. The kingpin of this adventure is Victor Vasarely, optical art painter. He establishes for himself and for the artists the cartoons from original templates using the technique of the enlarged photograph. The regular artists of the gallery are Dewasne, Deyrolle, Herbin, Magnelli, Mortensen, Pillet and Vasarely, associated with celebrities such as Arp, Taeuber Arp, Kandinsky, Léger and Le Corbusier. After a first exhibition in June 1952, many others take place in Paris or New York, including new artists as well, such as Albers, Agam, Sonia Delaunay, Van Doesburg, Bloc etc. The abstract tapestry knew at that time its full development. In 1960, Pierre Baudoin (cartoon painter) and Jacques Lagrange (artist) organize an exhibition of Coptic tapestries, lent notably by the Louvres museum, to the “Galerie d’Aubusson (Grenelle street in Paris) with André de Persine, landlord. Struck by the plastic art power emanating from these small formats, they convinced several artists to create small size projects: Arp, Braque, Calder, Edelmann, Gischia, Lagrange, Picasso etc. The weavings of these small size formats began from 1960 onwards. They are technically demanding, because at that scale, even the smallest flaw can be visible. A woven technique used for shading and transparencies.